Post x-ray it was clear it was game over for the season and its not so much the injury but the 8 months work to get me to Kalmar in top shape that’s so hard to swallow. It’s been a while since I posted and that’s because I have been licking my wounds. 2018 has been a real mixed bag. I took a big chunk of the year to improve my bike and bike to run and with a new coach and whole new focus on hard training. The aim for the year was Ironman Kalmar and to qualify for Kona and get my times down towards 9Hrs. The year started off well with a best time at Outlaw Half Nottingham then a good race on the mental side at IM 70.3 Switzerland (when things don’t go to plan can you push). However, in the building up to IM Kalmar and on my last long training ride I came of my TT bike and broke my clavicle & damaged rotator cuff. That’s not to mention the usual general battering and bruises – but at least the bike was OK ha. Figure 1. Me immediately post crash battered, bruised and collar bone snapped. Then post operation to removal of bandages and stitches. Post x-ray it was clear it was game over for the season and its not so much the injury but the 8 months work to get me to Kalmar in top shape that’s so hard to swallow. I was just about recovered from a van hitting me on a training ride from the year; so to be injured again on the bike was a real downer. The biggest issue is the time spent getting back to health and in shape to give it my all at Kalmar that was so hard to swallow. I have to say I had to consider that having 2 accidents resulting in a broken back in 2017 and broken collarbone in 2018 should I continue on. While that thought spun around in my mind I jumped back on the bike a few days post injury by rigging up a harness from my TRX. 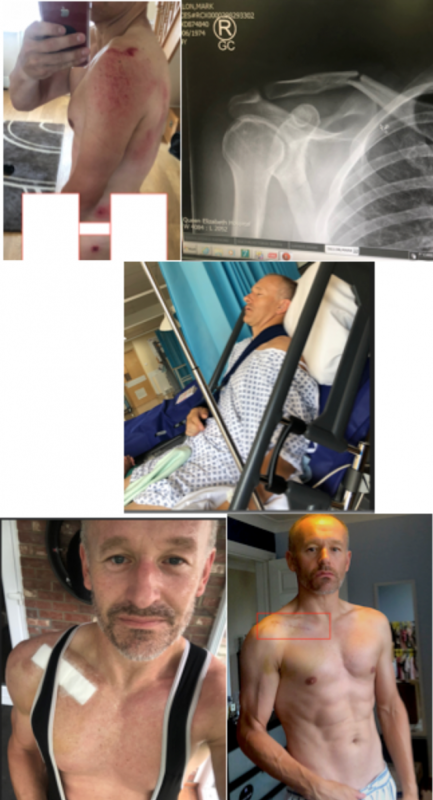 I though I could train as long as I didn’t have hold the bars of my road bike and the harness around the chest allowed me to avoid putting any weight through my arm and broken clavicle. I had some great advice including some from the ever winning Lucy Gossage which gave me some confidence in keeping active despite the damage. I only trained 3 times a week over the 1stfew weeks but after the 1stweek all sessions where short but high intensity. I figured if I could hold onto some of the gains when it came to making a decision of continuing on with Kona / sub 9HR dream then I would have some fitness as a base from some maintenance work. The last 3 years I have worked hard to improve my performance and in 2018 I had bumped up the weekly training to circa 15Hrs from 10Hrs the years before. The idea of giving up on that work, time away from the family, early morning and late training nights just stuck in my throat if I was just to quit. As you guys will know family is everything when we do this crazy sport and I am very lucky to have a really supportive wife and a daughter who loves to see her dad race (It’s a free holiday so what’s not to love). My motto has been to ‘Never Quit’ and this is painted on my pain cave wall. The other issue was if I gave up on the Ironman dream could I really just let it go without regrets? Once I had made the decision to give it another year it was a case of getting some races booked in so that a real focus could be brought back to training. Then to go back to the coach to get a program back in place. After 6 weeks post operation (break pinned and plated) I had a follow up x-ray which showed it still was not fully healed but I could run but no swimming. My final follow up will be next week (1st week November) and I should then have the all clear for swimming. Over the past 4-5 weeks I have managed to get back running up to 21km on long run at around 4.20Min/km and my bike has become the strongest to date. The latter has been as a result of getting up to 4 session in a week and all hard sessions around threshold. All threshold work, now above 4.2w/kg and feeling strong and attacking each workout. Like everyone its end of season and time to ease up on the diet. Always tough mentally as you get use to being lean but you need to let the body and importantly the mind unwind following the strain and stressors of the season. The cut off for me should always be around 6-7% of your race weight so you can gradually easy back on the diet and up the training. Those who fall outside of this range typically end up over dieting which results in poor recovery from training session and an increased risk of illness and injury. There is also the psychological issues of cutting back the calories so hard to the point people can break and start binge eating. Its now November and it’s the start of the next season of ‘structured’ training for me building to a half marathon in Feb. The marathon is no more than a target to keep me honest over the xmas period as I start to tidy up the diet. The next triathlon will be Challenge Salou in April and the ‘A’ race in September. Fingers crossed no crashes or white van man this year. With 2 IM distance events booked for 2019 I am hedging my bets I make at least one in good form without injury. So guys have a great xmas, keep safe if your out on those roads and all the best for 2019!